Custom plywood manufacturer Navy Island Plywood programs its own automatons to reduce rework and increase capacity. Click here to see a video of the robots in action at the company's Web site. Navy Island Plywood buys standard manufacturing robots, then customizes the machines by building custom heads and programming job specific functions. 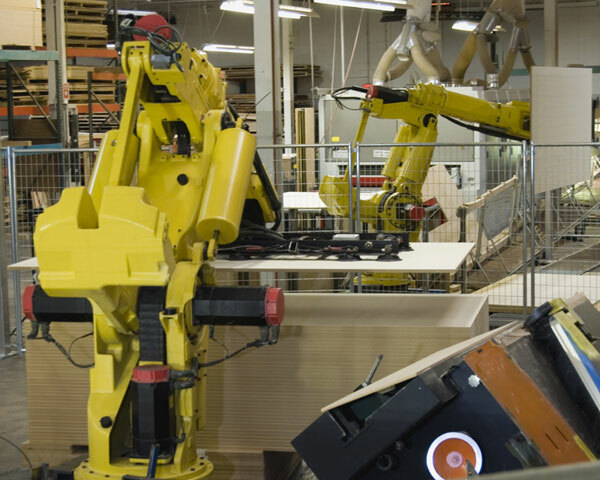 Navy Island Plywood’s implementation of robotic automation has neutralized costly rework, lessened worker compensation claims, improved employee retention and created more production capacity. Although the first robot the company installed arrived with a steep learning curve, getting the next two automatons to speed has been a far more painless process, says Jeff Stone, co-owner of the custom plywood manufacturer. And the company is just beginning its journey into automation, he adds. “Robots are used frequently in very repetitive tasks, and we surmised that with true complex programming, we might be able to make it work in a custom application,” Stone says. West Saint Paul, MN-based Navy Island has a 60,000 square-foot facility with 40 full-time employees when running at full capacity. It manufactures custom plywood for store fixture manufacturers, architectural woodworkers and high-end kitchen cabinet manufacturers for use in interior applications. The company works with a range of exotic veneers, from sapele to English sycamore, and all of its products are made to order, Stone says. The idea to automate parts of the company’s operation came during shop tours overseas, he says. The standard option for trimming panels was to run them through a tenoner. “The problem with that in a custom application was that we might have a 4 feet by 12 feet followed by a 2 feet by 6 feet, followed by a 5 feet by 10 feet, and in order for the tenoner to keep up with the product, it had to allow that last panel to exit before it reset to the dimensions of the next panel,” Stone says. In addition to the manual resetting required, he adds that the tenoners have a large footprint, which wasn’t compatible with Navy Island’s operation. “We were considering how do we trim, and keep up with the press, and that’s how we thought of a smaller footprint robot. Instead of allowing the panel to move through the cutters, the panel could be picked up and trimmed in a custom fashion,” Stone says. Jeff and his two brothers own the company, and the family decided to commit to three robots for their initial purchase. The goal is to continually increase the shop’s automation, and purchasing three machines would force the company to continue with its plan, even if the first robot was harder to calibrate than expected, Stone says. The robot at the sanding station has reduced rework by eliminating scratches because it moves panels using positive placement instead of sliding them into place. They looked into having an outside company program and build custom heads for the first robot, which would man the trimming saw, but decided to take the operation in-house. Although the cost was initially higher, Stone says that by doing so, the company now has the knowledge for subsequent installations. Navy Island buys standard manufacturing robots from FANUC Robotics, and then customizes them through programming, machining head attachments, bases and rigging. Although the first robot has a longer return on investment, it has already helped the company in a variety of ways, Stone says. He adds that this robotic disposition can carry over to production worker’s attitudes, and has improved employee retention. Robots have reduced rework, and helped with clear labeling. Before instituting the robot at the trimming station, employees would write abbreviations on products with markers, often creating confusion. The second robot, which took over material handling at the sander, also has reduced rework. Navy Island Plywood elected to customize the robots to its needs in-house, and each subsequent installation has been more efficient due to the knowledge gained from previous installations. The third robot, which has just entered the production floor and is still undergoing adjustments, also will have a big impact in the production cycle, and should quickly reap a return on investment. Each robot has presented its own challenges because they all perform such different functions, but each subsequent installation has gotten easier and less costly, Stone says. The company will continue its quest for more automation in the coming years, Stone says.